What is another word for confusion? The act of confusing, or the state of being confused; perplexity; distraction; embarrassment; shame. irritation, miscommunication, disturbance, dismay, helplessness, amalgamation. 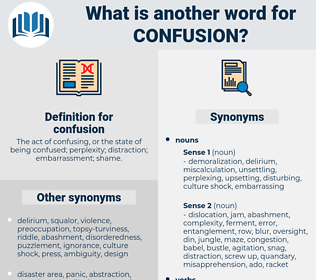 misunderstanding, disarray, ambiguity, obfuscation, commotion, misinterpretation, mix-up, uncertainty, dislocation, perplexity, muddle, mess, disruption, equivocation, misconception, embarrassment, intermingling, havoc, Blurring, misapprehension, vagueness, distraction, shambles, jumble, obscurity, fuss, turbulence, uproar, mistake, upheaval, clutter, tangle, hesitation, unrest, fiasco, mixing, doubt, concern, distress, chaos, apprehension, clarity, ambivalence. composure, sense, calmness, clarity, organization, happiness, peace, order, method, calm, orientation, system. ease, contentment, tranquility, harmony, clearness, simplicity, agreement, understanding, tidiness, neatness, expectation. coolness, stoicism, sureness, self-assurance, equanimity, poise, positiveness, certitude, plan, preparation, anticipation, indifference, aplomb, steadiness, conviction, certainty, orderliness, pattern, self-possession. She looked about at the confusion.
" I was about to go out," she repeated in confusion. 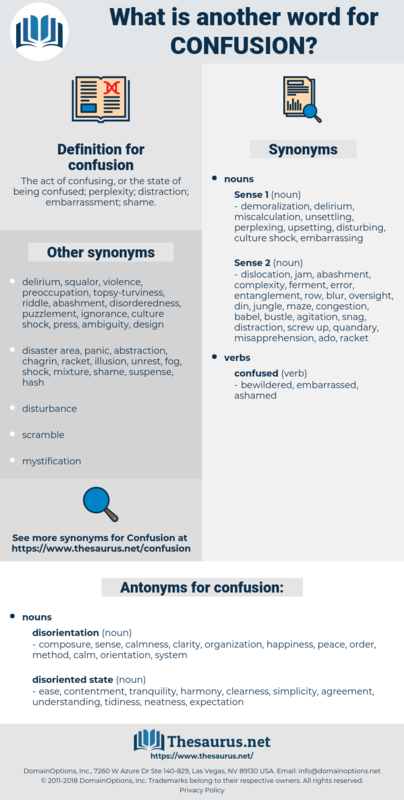 demoralisation, chaos, topsy-turvyness, pandemonium, bluster, shemozzle, bedlam, hugger-mugger, topsy-turvydom, schemozzle, demoralization.